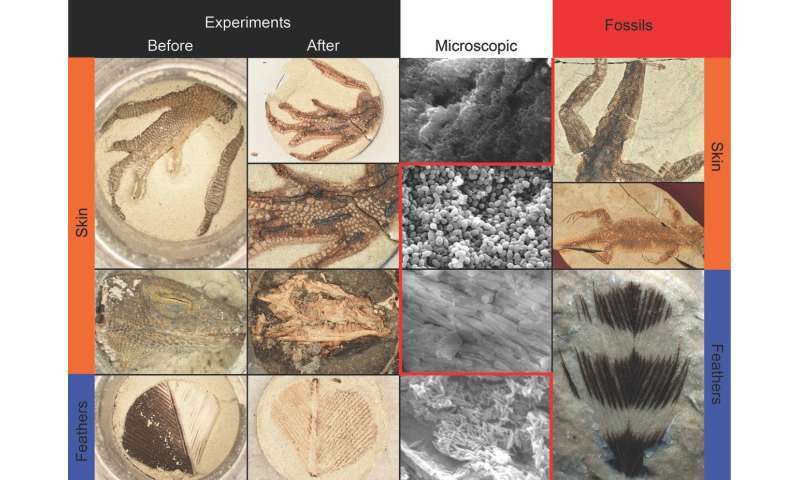 Experimental samples compared to fossils down to the microscopic structure of melanosomes. Credit: Fossil lizard images courtesy of Nicholas Edwards and Wang Yuan. For example, when Evan Saitta, who recently submitted his Ph.D. at the University of Bristol's School of Earth Sciences and is now a postdoctoral researcher at the Field Museum of Natural History in Chicago, ran these more traditional maturation experiments on feathers during his MSc (also at Bristol), the result was a foul-smelling fluid. Jakob Vinther, senior lecturer at Bristol's School of Earth Sciences and School of Biological Sciences as well as Saitta's Ph.D. and MSc advisor, added: "What we are coming to realise is that fossils aren't simply a result of how fast they rot, but rather the molecular composition of different tissues. However, it is inherently difficult to take the conceptual leap from understanding chemical stability to understanding how tissues and organs may, or may not, survive." More information: 'Sediment-encased maturation: a novel method for simulating diagenesis in organic fossil preservation' E. Saitta, T. Kaye and J. Vinther, Palaeontology, 2018.